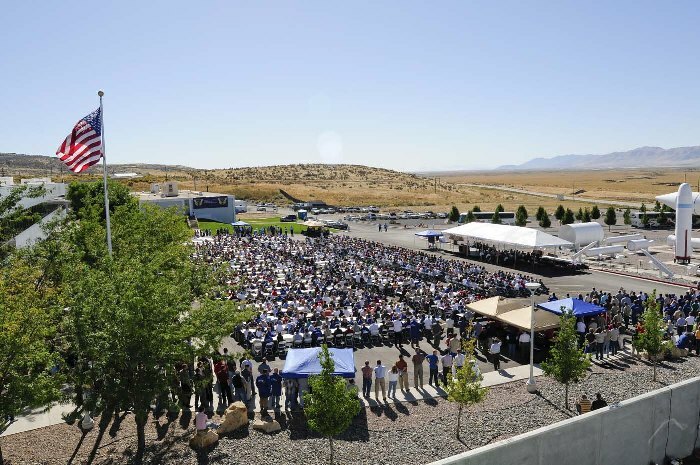 I was invited to speak to the assembled folks out in Utah who have just cast the last shuttle solid rocket segment. A few retirees and spouses made the event, but the crowd of over 2,000 was mostly active workers. Over a year ago in this blog space I told you that the horse has left the barn and the shuttle was shutting down. Now we are seeing evidence every day. However you feel about that, the direction has not changed. If there is anyone out there who thinks otherwise, . . . well. For 30 years, the United States and its international partners have relied on the space shuttle: costly, not as safe as we need, sometimes not very reliable, and now that is coming to an end. Four years ago, we had terminated contracts with 95% of the suppliers for parts for the external tanks. This has continued apace. For example, last week the contract was terminated for the suppliers of the specialized chemicals to make the black coating of the shuttle thermal insulation tiles. Also being shut down is the production of reinforced carbon-carbon wing leading edge panels. The folks up in the Dallas area are getting ready to take apart the one-of-a-kind jigs that are used in that process and clearing out the factory. Any museums want this thing? 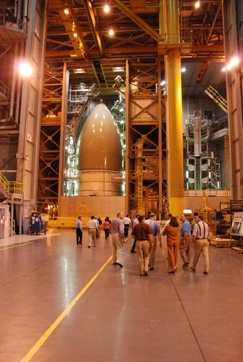 The external tank folks reported this week that the last ET has moved out of yet another workstation which is now surplus and ready for removal. Welding has been complete for some time, cleaning, painting, and foam application are still active. The MAF workforce is down to about half of what it was a few years ago. In the 1990s, almost 25,000 people worked for shuttle: civil servants and prime contractors. (This does not include subcontractors and vendors). By 2002, only about 16,000 folks worked on shuttle. There was a little peak for return to flight, but by 2006, the headcount was down to 16,000 again. Now there are about 12,000. And the number will decrease precipitously over the next year. This is not to make you feel good or bad or whatever, just a status report. Working in America’s space program is a privilege. Change is coming every day, and however you feel about the change, a wise person will be ready for it.